During college summers was an independent distributor for the Southwestern Company of Nashville, TN; selling educational products door-to-door. Received Gold Awards reflective of work ethic. A human resource management and systems professional with experience in diverse organizations, both internally and as a consultant. Special expertise in compensation and employee benefits design, administration, communications, and compliance. 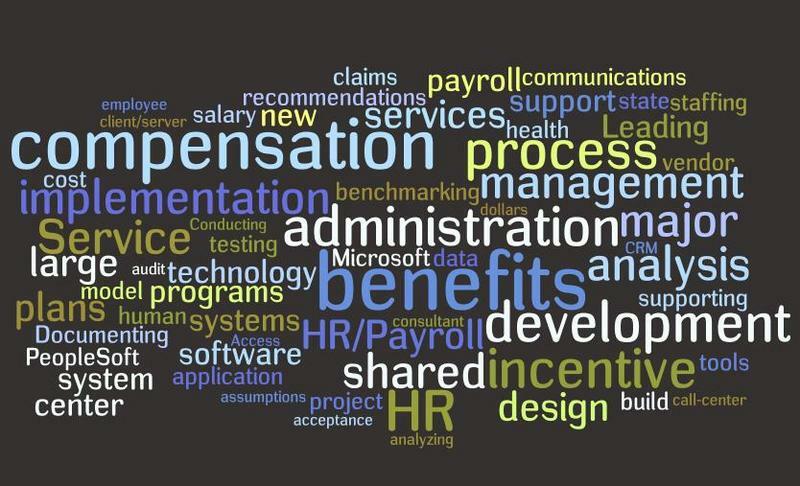 Extensive experience in HR/Payroll ERP and specialty support systems selection and implementation; implementation of shared service/call centers; and process improvement and benchmarking, Project management of systems implementations and conversions.Development of automation tools supporting a wide variety of processes, integrating MS Access, Excel and Word using Visual Basic for Appications and SQL.• Led the design and implementation of human resources and finance contact centers for a federal agency featuring PeopleSoft CRM HelpDesk for HR and CRM Self Service as the case management tools supporting over 30,000 employees. Saved client hundreds of thousands of dollars in licensing and maintenance costs by modifying software to support finance as well as HR.• Modeled early retirement incentive features for multiple units of a newspaper conglomerate, calculating ROI and payback periods for a variety of different assumptions as to benefit structures and acceptance rates. Projections resulted in millions of dollars of savings with payback periods of less than two years.• Developed the baseline analysis of the administration of the annual executive management cash incentive process for the shared service center of a major high technology firm, and developedrecommendations for process simplification. Documented the current state and proposing a new technology approach for the administration of employer stock-based incentives for the same firm. Mark and I worked together when at the time I was a partner with Hewitt Associates reponsible for Hewitt's global compensation systems including COMP+. Mark was Compaq's liaison with Hewitt responsible for the successul implemenation of COMP+, and quickly became one of the strongest users across the 100+ organizations using the system. His strong analytical and computer skills helped Compaq analyze their dynamic and expanding compensation and HR reporting needs. Mark has a strong desire "roll up his sleeves" and dig into the details to ensure a sold base of understanding. He is a quick learner and is able to apply learnings to solve new problems in different areas." I had the privelege of working with Mark at Compaq Computer Corporation several years ago whilst we were building a compensation platform and infrastructure for a fast-paced and growing enterprise. Mark demonstrated incredible talent in devising compensation systems and processes to support the many facets of our business and importantly, showed the dedication, commitment, and coustomer focus to ensure that the end products satisfied all constituents. I would not hesitate to recommend Mark for any capacity in the compensation and benefits function. “It is a pleasure to introduce and recommend Mark to you. Mark and I worked together at a billion dollar NYSE company where Mark provided critical support to our overall human resources program through his knowledge, expertise, and passion for compensation, benefits, systems, and processes. Mark has always been diligent and exacting in his responsibilities, always seeking to find the better way. He demonstrates great logic and a methodical approach to his work. The great thing about working with Mark is that when you give him a task or problem, you can sleep nights knowing that it is in good hands, he will deliver positive results, and will do so in a "quiet" manner. I encourage you to get to know Mark as you will not be disappointed." Leading compensation and benefits functions at this leading manufacturer of forklift trucks. Assisted a health care client with implementation of Oracle PeopleSoft 9.1 Benefits Administration module. Human Capital and Information Technology consulting resource to the clients of Resources Global Professionals. From more than 80 offices in North America, Europe and Asia Pacific, Resources serves 2,100 clients in 66 countries.Mark supported clients in the areas of contractor management , succession planning, and HR and Payroll compliance. He also gave a well-received presentation to the Benefits Special Interest Group of HR Houston, the local SHRM affiliate, on the topic of "Fiduciary Responsibility for Your Employee Benefit Plans".He also provided IT consulting supporting the supply chain management function for an energy client. His clients while at Resources Global Professonals included Spectra Energy Corp., Core Laboratories L.P., MidStates Petroleum Company LLC, Rockwater Energy Solutions, Inc., and BP p.l.c.. Assisted Enbridge with a PeopleSoft 9.1 HRMS implementation for the United States and Canada, including serving as a subject matter expert for Compensation. BearingPoint is a global management and technology consulting company known for its deep industry experience and high customer satisfaction. The company provides strategic consulting, applications services, technology solutions and managed services to government organizations, Global 2000 companies and medium-sized businesses around the world. KPMG LLP split off KPMG Consulting In 2001 wiith an initial public offering,and in 2002, the corporate name was changed from KPMG Consulting to BearingPoint. Consulted within the following practices: USA Cross Industry Enterprise Solutions, World Class HR; and most recently, Human Capital and Strategic Change. Designed remuneration programs and HR policies. Improved compensation administration processes. Designed and implemented HR shared service/call centers; supported HR system selection, development, and implementation; HR/Payroll benchmarking; and HR/Payroll administrative process design and outsourcing. Implemented Oracle PeopleSoft HR/Payroll ERP products as well as specialty HR software.• Led a team in the design and implementation of human resources and finance contact centers for the USDA Forest Service featuring PeopleSoft CRM HelpDesk for HR and CRM Self Service as the case management tools supporting over 30,000 employees. • Developed and led the use of automated tools to comprehensively audit the financial and indicative data migration between legacy and successor HR and Payroll systems at Wyndham Worldwide. • Developed an online survey tool and data analysis tools for gathering and analyzing payroll benchmarking and best practice information for the American Payroll Association's Large Employer Task Force. Had primary responsibility for statistical analysis, participant communications, and steering committee coordination over a five-year period. During this period Enron was the world’s leading integrated natural gas and electricity company, owning approximately $23 billion in energy related assets, and delivered risk management solutions to the energy and water resources market.Responsible for overall management of the company’s defined benefit and defined contribution plans [401(k) and ESOP] through a staff of ten. Functions included in-house pension determination, retiree payroll and tax reporting. • Reorganized qualified benefits staff structure and duties to better support efficient administration. • Developed automated tools to support non-discrimination testing and process vested terminations.• Led major project to improve accuracy of data in the pension administration system.• Developed a pension application in Microsoft ACCESS that produced over 35 data-driven variations of terminated vested letters. Fortune 500 international corporation that was of one of the world's largest producers of copper. Now merged with Freeport McMoran Copper & Gold. The company's 1996 revenues exceeded $3.7 billion and it employed more than 16,000 across 26 countries.• Managed large projects inclucing the vendor selection phase of an $18,000,000 HRMS/HRIS project. • Designed and developed systems support compensation and benefits administration in areas of executive compensation, issues and projects tracking, and government filing status and ERISA compliance.• Led staff in developing well-received client service model.• Designed functionality for a new pension administration database application. • Coordinated efforts to settle a $5,000,000 GIC in default that was owned by a Phelps Dodge 401(k) plan. Developed participant allocation and communication plan for proceeds. • Managed all responsibilities relating to $200,000,000 401(k) plan.• Conducted comprehensive audit of trustee and recordkeeping transfer to new vendor.• Integrated the deferral elections of qualified and non-qualified plans.• Built applications supporting non-discrimination testing, health claims analysis, salary structure development, and external job matching. • Developed "S"-curve incentive formula to replace current stair-step for a major sales division.• Installed third-party client-server compensation administration system and developed in-house job matching system on SQL Server platform. The Dr Pepper/Seven Up Companies, Inc.was the privately held holding company for these brands during this period. The subsidiary companies manufactured and marketed beverage concentrates and syrups for namesake brands and others. Responsible for planning and administration for all welfare and qualified defined benefit plans and two 401(k) plans, and extensive non-qualified executive benefits for these two companies. Supervised a staff of five with responsibilities for in-house 401(k) recordkeeping, pension benefit determination, and health claims processing; as well as pension withholding and reporting, trust financial statement preparation, and ERISA and DOL compliance. • Led staff in total redesign of annual employee benefit statements, which resulted in recognition from management.• Researched options and developed a solution involving a plan merger that enabled newly assumed pensioners to receive payments even though assets had not yet been transferred from the predecessor trustee.• Health claims processing staff attained error rate of less than 0.2% as determined by outside audit. Privately held healthcare management company. Subsidiaries marketed pharmaceuticals and owned Partners National Health Plans, a joint venture with Aetna Life & Health Insurance Company.Administered pension, 401(k), health, and welfare plans for parent corporation and subsidiaries. Benchmarked executive compensation and administered the salaried and hourly pay programs. Designed sales and service incentive plans. Coordinated restatements of retirement plans. Assets of the former Reading & Bates Corporation are now owned by TransOcean. At the time, annual revenues were approximately $1 billion, from oil & gas exploration, offshore drilling, and coal mining.Managed domestic and international defined contribution plans. Coordinated ERISA, DOL, and SEC compliance for all retirement plans, including all plan revisions due to law and regulatory change, government filings, and IRS negotiations. Designed forms and workflow for a new HR/Payroll system. Led development, testing, and implementation of in-house online health claims processing and trust recordkeeping systems.